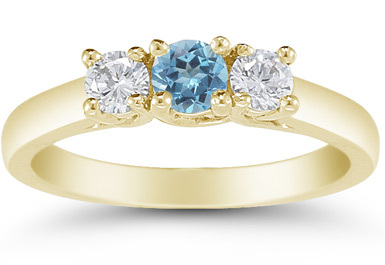 Sophistication is redefined with this stylish three stone ring. An Apples of Gold creation, the buffed yellow gold band brings dignity to the ring with a solid foundation. Two round cut white diamonds dazzle you from either side, measuring 0.15 carats each. The diamonds frame a beautiful blue topaz gemstone that measures 4mm but brings so much more with its rich blue color. The combination of traditional yellow gold, highly precious white diamonds, and the remarkable blue topaz gemstone equals a truly elegant look. We guarantee our Three Stone Blue Topaz and Diamond Ring, 14K Gold to be high quality, authentic jewelry, as described above.